All transactions are safe and secure with a reliable history in online purchasing behind each of our associates. 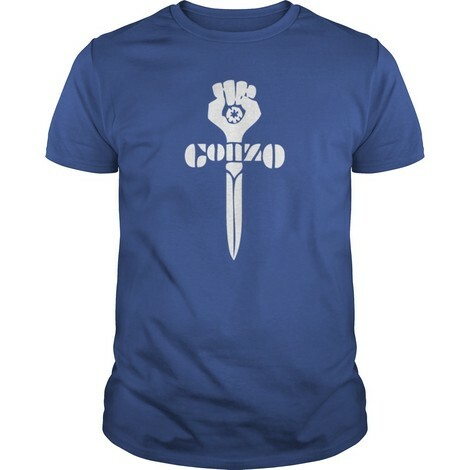 Buy the Gonzo Hunter S. Thompson t-shirt to own Fear and Loathing clothing and merchandise. The Gonzo symbol on the Hunter S. Thompson t-shirt on the left is nearly identical to the image that Thompson used on campaign posters during his run for sheriff of Aspen, Colorado. The term "Gonzo" refers to a style of journalistic research, popularized by Thompson, where the author participates in the subject action instead of being a passive observer. This term was the inspiration for the name of Benicio Del Toro's Fear and Loathing character, Dr. Gonzo. Below the Gonzo logo is a Hunter S. Thompson quote that has been related to Thompson himself. In addition to the Gonzo Hunter S. Thompson tee above, browse the Fear and Loathing Clothing Gallery for more apparel like men's and women's clothes, kids shirts or hoodies.